Osgood, Indiana’s Gary Hume won his first career Besslers U Pull N Save Hornet Feature on Saturday night. 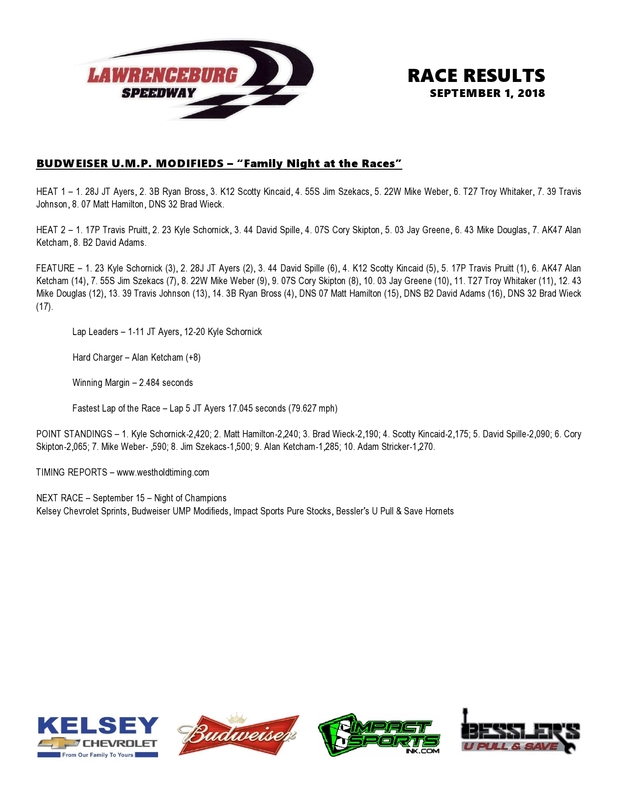 The Hornet Nationals, originally scheduled for August 25th, was run on September 1st. 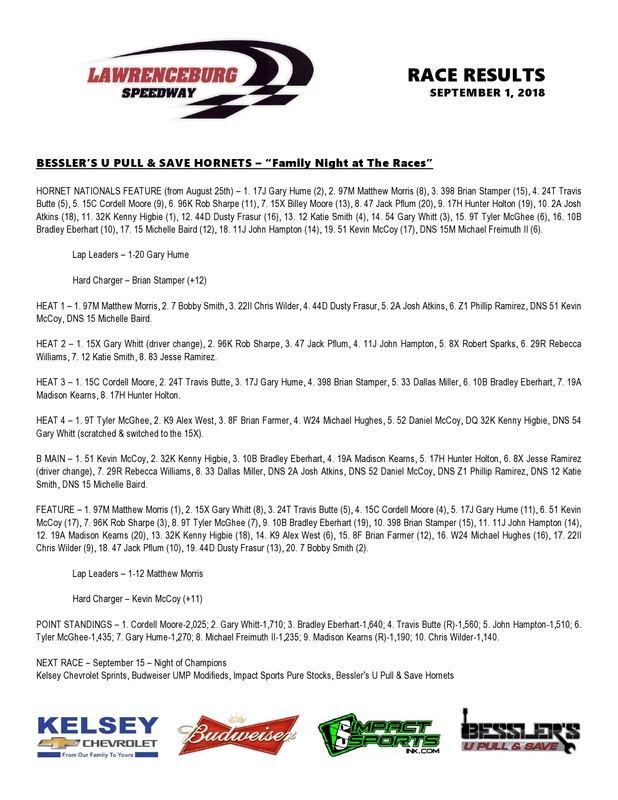 The 20 lap Hornet Nationals was the highest paying Hornet racing in the history of Lawrenceburg Speedway with the winner taking home $1500 and the total purse at $7000. Hume would lead all 20 laps beating Matthew Morris, Brian Stamper, Travis Butte, and Cordell Moore. Mike Engel Wins School Bus Race! Mike Engel won his second School Bus race at Lawrenceburg Speedway this year. Engel also won the Bus race back In July on The Night Of Destruction. Josh Shaw in the Shark Bus led the first 3 laps before losing the lead to Engel who led the remaining 7 laps. Roger Christman got around Shaw for second with Shaw finishing third, Josh Ballew and Dan Launderville rounded out the top 5. Abrams Wins Second Sprint feature of Year! 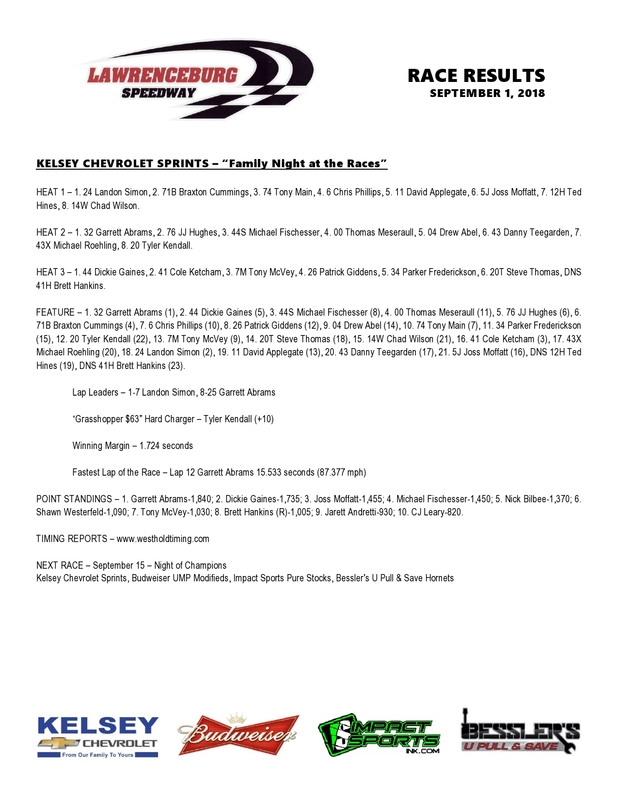 Rushville, Indiana’s Garrett Abrams picked up his second feature win of the year and is 1 race away from clinching his first ever Kelsey Chevrolet Sprint Car Track Championship at Lawrenceburg. Abrams took the lead on lap 8 when the red flag came out for then leader Landon Simon crashing hard in turn 1 when a slow car had spun out and stopped right in front of Simon. Simon had already committed to the high side and had no where to go slamming hard into the stopped car. When the race resumed, Abrams assumed the lead and led the final 17 laps holding off second place driver in points Dickie Gaines. The rest of the top 5 was Michael Fischesser, Thomas Meseraull, and JJ Hughes. Heat race winners were Simon, Abrams, and Gaines. Abrams enters the last race of the season with a 105 point lead over Dickie Gaines in the battle for the track championship. Schornick Wins Again, closer to winning Title! Kyle Schornick, passed leader JT Ayers on lap 12 and went on to pick up his third Budweiser UMP Modified feature win this year and for the most part, clinched the 2018 Modified Track Championship at Lawrenceburg. JT Ayers finished second followed by David Spille, Scotty Kincaid, and Travis Pruitt. Heat race winners were Ayers and Pruitt. Schornick, will clinch his first track championship when he signs in to race on Saturday September 15th. Morris Wins Second Hornet Feature of year! Louisville, Kentucky’s Mathew Morris races at Lawrenceburg only a handful of times each year. You can bet that when he does, he will contend for the win. Already coming off a runner up finish in the Hornet Nationals earlier in the night Morris dominated the Besslers U Pull N Save feature by leading all 12 laps. The rest of the top 5 was Gary Whitt, Travis Butte, Cordell Moore, and Gary Hume. Heat race winners were Morris, Whitt, Moore, and Tyler McGhee. Kevin McCoy won the B Main. Cordell Moore will be crowned Hornet Track Champion for the second year in a row. Eichler Wins Pure Stock Feature! 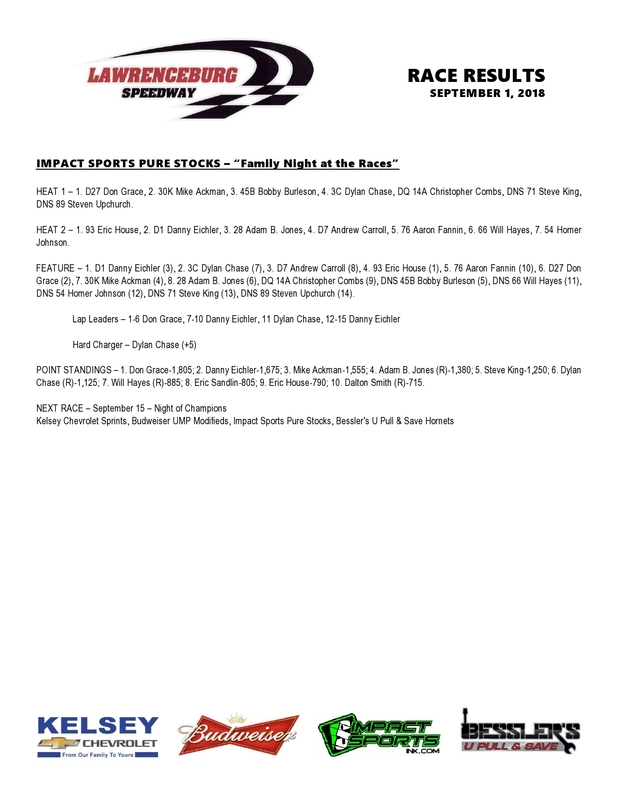 Danny Eichler won the Impact Sports Purestock feature in a crash filled race that saw the leader Don Grace crash collecting Christopher Combs, and a separate crash involving Eric House and Mike Ackman causing major damage to both their cars. Eichler held off a hard charging Dylan Chase for the win with rookie, Chase grabbing is best ever feature finish. Andrew Carroll finished second followed by Eric House and Aaron Fannin. Heat race winners were Grace and House. Don Grace will enter the last race of the season with a 130 point lead over Danny Eichler.